One of the most popular and important units in a professional or home gym is a weight bench. This one item offers you many workout options and challenges. It doesn’t matter whether you are new to weight training or whether you are a seasoned lifter; variety in your training session can help to motivate and enjoy your workout more. There are many different weight benches by various manufacturers available on the market. They all vary in features, designs, materials, and effectiveness. So, how do you select the best weight bench? 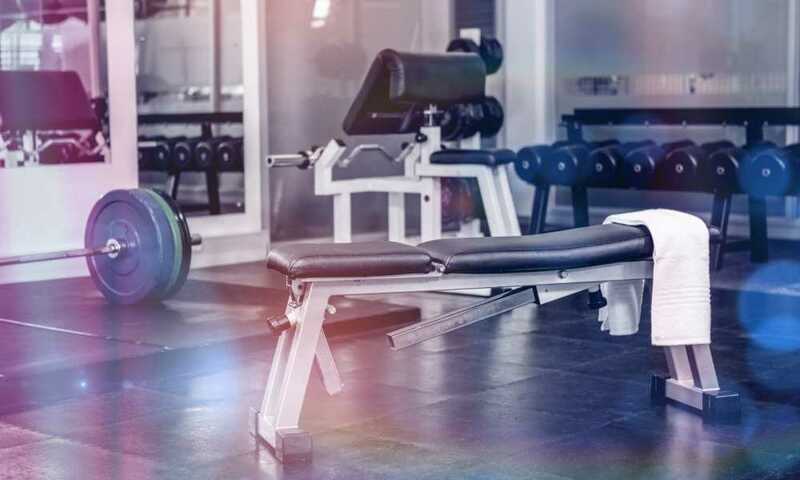 Read on to find out the top 5 weight benches as well as a handy buyer’s guide to help you make the most informed decision. How much weight is a bench press bar? How much should I bench for my weight? What is the most weight bench pressed? How to make a bench press at home? What is an incline bench press? For lifters who do not want to spend too much on a weight bench, but still want a high-quality product, this offering from Fitness Reality is fantastic value for money and boasts many amazing features that both beginners and seasoned lifters will enjoy. This bench can handle up to 800 pounds of weight, giving you plenty of room to improve as you get stronger. The front leg can adjust between two different positions and the backrest can also be adjusted to include a total of 12 positions. Users that are as tall as 6’4” can use this weight bench with ease and can adjust the back to suit their height. The backrest can be adjusted from a 20° decline to an 80° incline, which is very useful when shaking up your training session. The detachable 3-position leg bar can be adjusted to add stability throughout your workout. While the Fitness Reality has a really small footprint, it provides a great deal of sturdiness. The unit can also be folded down to easily store away. This bench also weighs only 35 pounds and has transport wheels so you can simply move this weight bench around. The weight capacity far exceeds what one would expect for a weight bench this price. It can handle 800 pounds and neatly folds up to store away. There are 12 adjustable positions to give you more options. Some users questioned the stability of the weight bench, especially when used by larger people. The wheels are also a bit small. You also need to place this bench on a non-slip surface or it can slide around. This bench is built for serious lifters. The high-density padding provides you with support and comfort. The racks have nifty safety hooks, while the front leg stabilizer offers stability and safety. This weight bench can be used with most 6- and 7-foot weight bars. The outer catch has a width of 38.5 inches, so the length of your bar collars must simply be wider than this in order to use it with this unit. The adjustable backrest boasts 7 different positions, including incline, flat, decline, and military positions which give you a great deal of versatility in this one machine. The adjustable foam rollers on the leg developer can be used for leg extension and leg curl exercises. The Body Champ BCB5860 bench comes along with many useful accessories, including a preacher curl pad, Olympic plate adapter, arm curl bar, ab crunch with handles, and a spring clip for the leg developer. The rack also has built-in safety hooks to improve safety, while the no-pinch design helps prevent grip and hand injuries. 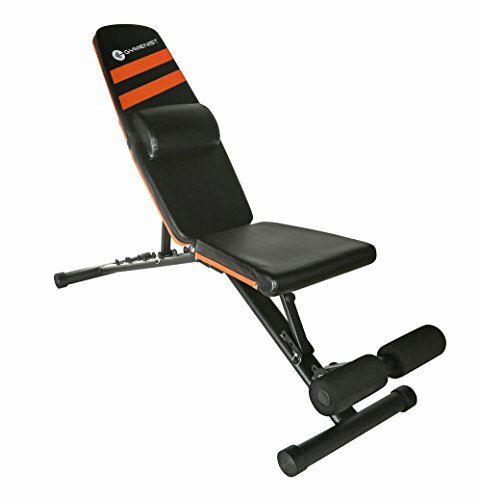 This weight bench has an adjustable dual-action leg developer that boasts adjustable foam rollers which can be used for leg extension/curl exercises. This Body Champ bench comes with an Olympic plate adaptor, arm curl bar, preacher curl pad, and ab cruncher. Moving this bench between the various incline and decline positions can be a bit tricky. If you are a shorter user, you may also find that the bench is a bit high and that you struggle to get a proper position for your feet on the ground when training. If you are looking for a travel bench that can easily be stored, but also has great weight-bearing capabilities, this bench may be just what you are looking for. This bench can be adjusted into various positions between decline, incline, and flat. The seat can be adjusted between 3 different positions that allow you to truly customize your workout to suit your body size and height. The back of the bench has 6 different adjustable positions which gives you a lot of variety in your training session. The Gymenist Exercise Bench includes a free back cushion that can be attached to the back of the bench and moved up and down as needed to support your back more comfortably and appropriately, especially when you are lifting heavy weights that can place pressure on your back. The Gymenist can support a maximum weight capacity of 500 pounds, which is perfect for a home and travel weight bench. This bench has leg rollers that keep your feet in place, especially when you are doing bench presses or situps. The upholstery is robust and durable enough to withstand regular use. Some users complained that the bench was wobbly, especially when in the incline position. The product also states that no assembly is required and that the bench is usable right out of the box, but it comes in parts that must be assembled. This bench is great if you want a durable bench without the expensive price tag. It is perfect for beginners or those who do not want to lift super heavy weights. This bench is easy to store and has a high-quality build that will last for years to come. The elegant, sleek, aesthetically pleasing design of the Marcy Adjustable SB-670 is as visually appealing as it is useful. It is able to adjust between 6 different back positions, allowing you to switch between decline, flat, and incline in seconds. The price of the weight bench is fantastic value for money and is the perfect choice for those not looking at spending a lot but still wanting the benefits of a high-quality bench. The powder-coated steel construction is solid and durable, while also being water and rust resistant. The Marcy weight bench is great if you are just starting your weight training journey, and it is also great if you are an experienced lifter looking for something that can fit in limited spaces in your home or apartment for days that you don’t want to venture out to the gym. This unit weighs just 51.4 pounds and can fold flat for easy and quick storing. It also has a small footprint, so you can leave it setup without it being too imposing. The steel construction allows a 300 pound maximum weight capacity. You can use this bench as a utility, decline, or incline bench. The pad is made with high density foam and is upholstered for comfort and durability. Most weight benches that are available in this price range only have 4 positions; however, this bench has 6 adjustments. Assembly is also quick and easy thanks to the simple-to-follow instructions. The high-quality material also gives you confidence when using this bench, and it conveniently folds for storing. This weight bench only has a 300 pound maximum weight capacity, which may not suit lifters looking to do more advanced workouts. Some heavier lifters also claimed that the bench’s durability would not withstand their training sessions. You can now have gym quality equipment in your home thanks to this weight bench by Merax. It is made to meet the same grades as gym benches, both in performance and in quality. This handy, foldable bench has been upholstered with durable, high-quality vinyl material that can withstand even the toughest workouts. The vinyl is water resistant and wipes down quickly for easy maintenance. This bench has a low profile and has been constructed using heavy-duty, high-quality, steel that boasts a maximum weight capacity of 800 pounds. It provides solid and stable support for your body and your weight during lifting sessions. The back of the bench has a solid welded ladder that allows you to adjust the bench between 6 various angles ranging from decline and incline to flat. This lets you get the workout you want at the angle you want. There are also 4 seat positions for users to set according to their height. The dense foam pad that covers the bench offers a soft yet firm surface that provides you comfort and support during long workouts or heavy lifting, so you can easily work on your back, core, chest, or arms without worrying about straining or injuring yourself. The built-in padded, removable leg rollers support your legs when doing bench presses or sit-ups. The footprint of this bench is surprisingly small for the high 800 pound weight limit. The assembly instructions are quite poor and require you to use quite a bit of intuition when building the bench. The seams are also only single stitched rather than double stitched, which could be a problem in the long run. There are six different types of weight benches available. This is the most common and popular type of bench. A flat bench does not come with any attachments. The main muscles that are exercised with a flat bench are the shoulders, chest, and arms. An Olympic bench is used by advanced and professional lifters and are typically wider and longer. This type of bench comes with extra equipment such as weight plates, a squat rack, dumbbells, rod, and more. An Olympic weight bench is a complete unit that allows you to do more advanced workouts. Adjustable weight benches are similar in shape and size to a flat bench but are more flexible, allowing you to do various workouts by simple adjusting the bench to a declined, inclined, or flat position. This type of bench can easily be folded and moved around to any location of your choice. These benches are great for simple workouts, but do not come with as many features due to needing to fold. Abdominal benches are best for those looking to do core and abdominal intensive workouts. You can set the bench in decline, incline, or flat positions based on the exercise you are doing. These benches also have foot rollers so you can lock your feet in place when training. If you are looking to develop your arm muscles rather than your whole body, this type of bench is made specifically to do preacher curls to develop your biceps. When looking at the maximum weight load, you need to consider how much weight you plan to lift at your strongest, and how much you will weigh at your biggest. There is no compromising here: cheap is a no-no. A good weight bench should last you a lifetime and should be able to handle a minimum of 300 pounds. The higher the maximum load, the better. The warranty will show you where the bench manufacturer made the compromise between versatility and sturdiness. The more foldable and complicated, the less study the bench is, and vice versa. The easiest way to determine how stable the product is will be to look at the warranty. The longer the warranty, the better the quality. When purchasing a weight bench, you want at least a 24 month warranty; however, the best is a lifetime warranty. It is vital that the materials used in the construction of the weight bench are high quality and strong. The weight bench you select should be made with thick steel pipes. If possible, find a bench that is constructed with solid metal with powder coating so that it does not rust. The material will also dictate the amount of weight you can use when on the bench. Selecting the style of your weight bench is determined by what your needs are. We looked at the different types of weight benches, but each type of bench comes with its own style. Some may be longer and wider, while some may be shorter and more compact. This decision will be determined by your needs and your preferences. Weight benches typically come with a black or grey color which does not show dirt or sweat. Some weight benches have color on their padded backrests, but this comes down to personal preference. Different bench press bars weigh different amounts. A standard bar, trap bar, cambered bar, and Olympic bar all weigh 20.4 kg. A safety squat bar weighs between 27 kg. and 29.5 kg. A Swiss bar weighs 15.9 kg. A curl bar weighs 6.8 kg. When you first begin working out, you should bench around 60% of your weight for the first 3 to 9 months. Once you have built up your strength for 9 to 24 months, you can work your way up to 90-100% of your body weight. Advanced weight lifters who have been training for yours should bench 130-165% of their body weight. The most weight ever benched by a man was 487.6 kg. (1,075 lbs.) by Ryan Kennelly in 2008. Becca Swanson holds the women’s record for the most weight benched at 272.5 kg. (600.8 lbs.). An incline bench press allows you to exercise your shoulders, chest, and arms thanks to the inclined bench. The incline makes it safer for your muscles and joints when lifting. An incline bench press is much like a flat bench, but the bench is inclined to a certain degree. Most of the time these types of benches can be adjusted between angles. Limited weight bench choices used to keep many people from using this valuable piece of equipment at home. This is one of the big reasons gyms became popular. However, this has all change in the last decade with the availability of high-quality, durable weight benches for home use. There are many types and models to choose from, but as you have read, we chose 5 of the best available right now. With all of the features considered, our favorite is the Fitness Reality 1000 Super Max Weight Bench thanks to its 800 pound weight capacity and strong, powder-coated steel frame. It is also foldable for easy storage and can be moved between decline, incline, and flat positions.